The Falcon gradually grew bigger and was 184 in (4,680mm) in 1969, when Ford introduced a new "small" Ford that was "only" 179 in 4,560 mm) long. 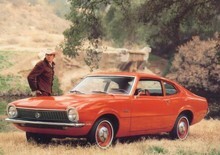 This was the Maverick which was termed a "sub-compact" in the USA. The Maverick was powered by 2.8 and 3.3 litre six-cylinder engines so that it was not in reality a small car. When the demand for a genuine small car increased, Ford introduced the Pinto in late 1970.